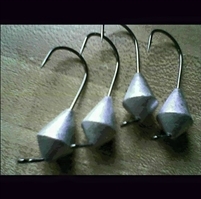 Black Nickel Mustad Ultra Point hooks in either 60 or 90 Degree 4/0. Gamakatsu hooks in either 60 or 90 Degree 4/0. Use the Phat Head to give your tube more of a Goby style look. Mustad hooks in 60 Degree 4/0. Use the Phat Head to give your tube more of a Goby style look. Gamakatsu hooks in either 60 or 90 Degree 4/0.